Rhizome short creeping or erect, up to 8 mm in diameter; rhizome scales up to 14 x 1 mm, margin irregularly lacerate, reddish-brown, linear, tapering to a point. Fronds tufted, erect to arching, 5-17 per plant, herbaceous. Stipe 20-54 cm long, pale brown to reddish brown at base, with a longitudinal groove above, densely set in the lower half with a mixture of fine, hair-like scales and large, ovate, reddish-brown scales, scales 6.5-20 x 1.4-6 mm. Lamina up to 65 × 30 cm, narrowly ovate in outline, attenuate, 2-pinnate, with basal pair of pinnae not or only slightly reduced. Pinnae up to 26 free pairs, to 14 x 2.8 cm. Pinnules elliptic to obovate in outline, basal acroscopic lobe well developed; margins aristate with aristae ± 0.5 mm long, basal basiscopic aristae folded in over the upper surface of the lamina; upper surface subglabrous, lower surface sparsely set with hair-like scales. Rhachis and secondary rhachis with matted, reddish-brown twisted hair-like scales up to 4.5 mm long. Sori round, in 2 rows halfway between the margin and the costules, c. 1 mm in diameter; indusia c.0.5-1 mm in diameter, peltate, erose, persistent. transvaalense: from the Transvaal, South Africa where the type specimen was collected. Moist forest, sometimes dry evergreen forest or bamboo, often near water. Cameroon, Dem. Republic of Congo, Equatorial Guinea (incl. Bioko), Eritrea, Ethiopia, Kenya, Lesotho, Malawi, Mozambique, Rwanda, South Africa, Sudan and South Sudan, Tanzania , Uganda, Zambia, Zimbabwe. Burrows, J.E. (1990) Southern African Ferns and Fern Allies. Frandsen, Sandton. Pages 314 - 315. (Includes a picture). Crouch, N.R., Klopper, R.R., Burrows, J.E. & Burrows, S.M. (2011) Ferns of Southern Africa, A comprehensive guide. Struik Nature. Pages 460 - 461. (Includes a picture). Jacobsen, W.B.G. (1983) The Ferns and Fern Allies of Southern Africa. Butterworths, Durban and Pretoria. Pages 447 - 448. 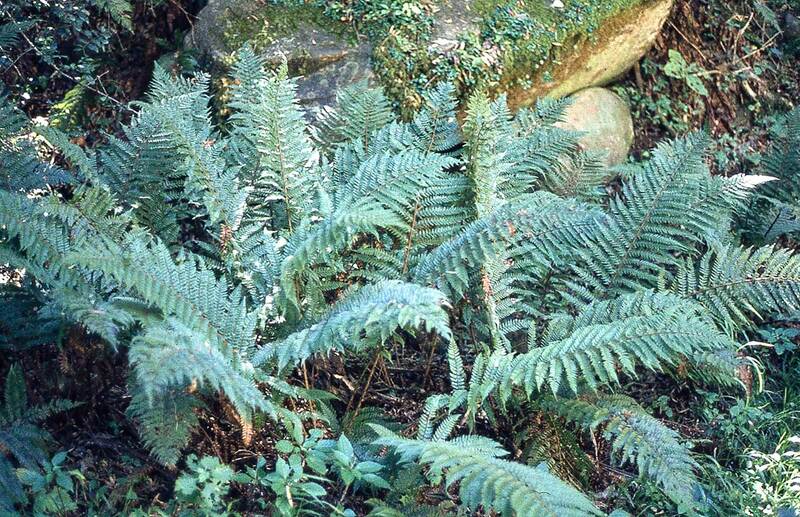 As Polystichum setiferum (Forssk.) Moore ex Woynar var. fuscopaleaceum (Alston) Schelpe (Includes a picture). Roux, J.P. (2009) Synopsis of the Lycopodiophyta and Pteridophyta of Africa, Madagascar and neighbouring islands. Strelitzia 23, South African National Biodiversity Institute, Pretoria. Page 139. Roux, J.P. (2001) Conspectus of Southern African Pteridophyta. Southern African Botanical Diversity Network Report, 13 Page 130. Roux, J.P.; Shaffer-Fehre, M. & Verdcourt, B. (2007) Dryopteridaceae. Flora of Tropical East Africa, Pages 32 - 33. (Includes a picture). Schelpe, E.A.C.L.E. (1970) Pteridophyta. Flora Zambesiaca, 0 Page 226. As Polystichum setiferum (Forssk.) Moore ex Woynar var. fuscopaleaceum (Alston) Schelpe (Includes a picture).